As a follow-up to my last post on Whitman, I wanted to explore more examples of how writing develops over the course of a poet’s career. 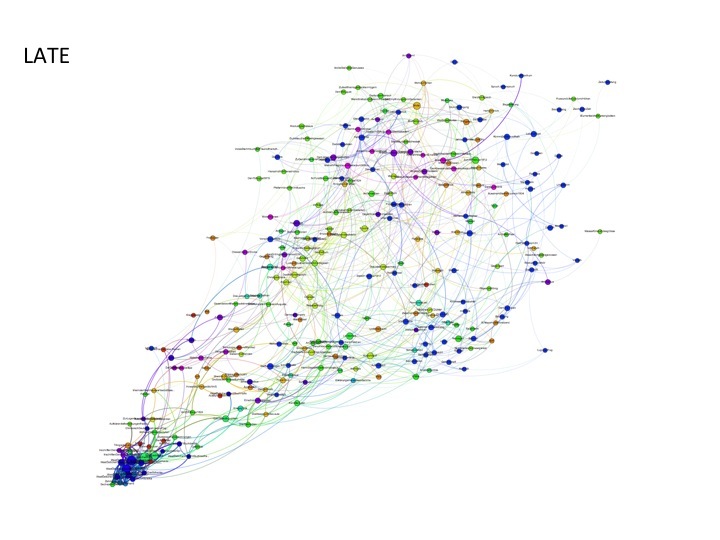 As I wrote there, I’m interested in using network theory to better understand how a poet’s career might have a particular shape or orientation, indeed, how one might visualize the “career” itself. What are the connections between the highly local creative process of writing poems and a larger sense of the whole, of how one’s writing and a sense of one’s life line up? If Whitman gives us one idea to work with — that the arc of the poetic corpus is towards consolidation, consensus, and compaction — I want to explore two other writers here, the Romantic poets J.W. Goethe and William Wordsworth. 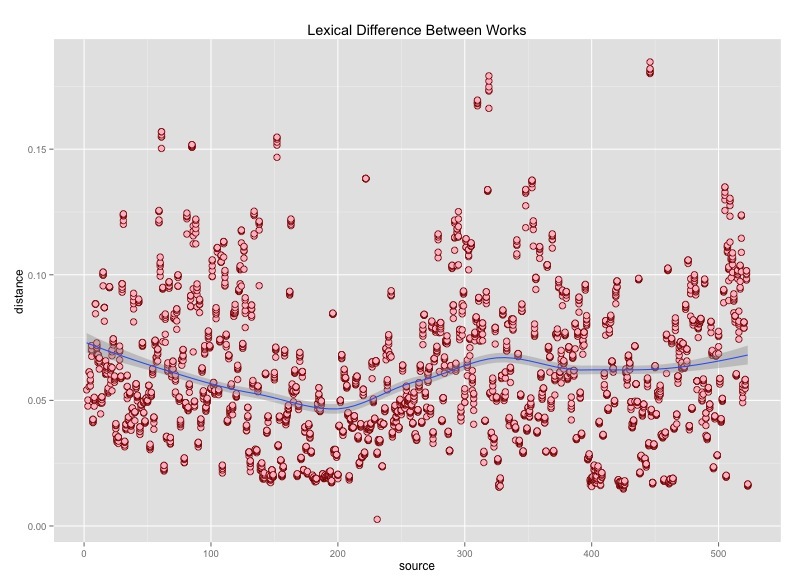 The point is not simply to find different types of careers, but also to understand how the patterns and groupings within a corpus work over time. To borrow Ted Underwood’s expression, not just how literary periods matter, but how periods within a person’s life matter, too. The first example is the career of J.W. Goethe. 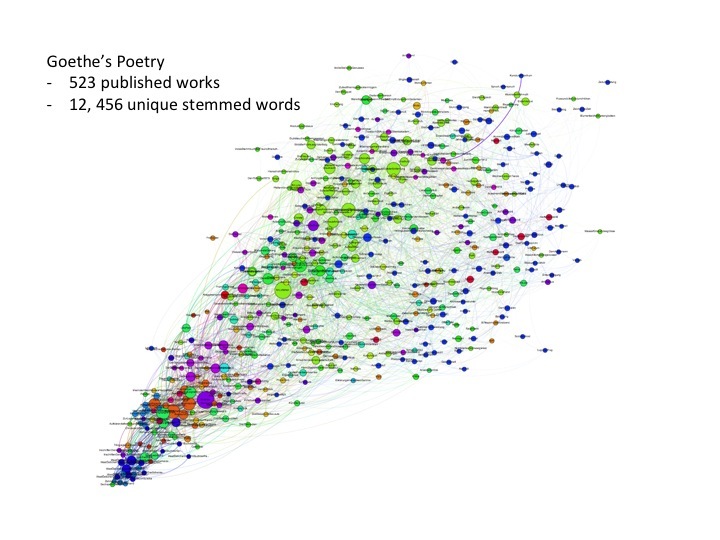 Below you can see network graphs of his published poetry (I’ll return to the distinction about publication later). There is the full graph followed by his poetry broken down into the traditional three-part period scheme usually used to understand his career (early, middle, late). 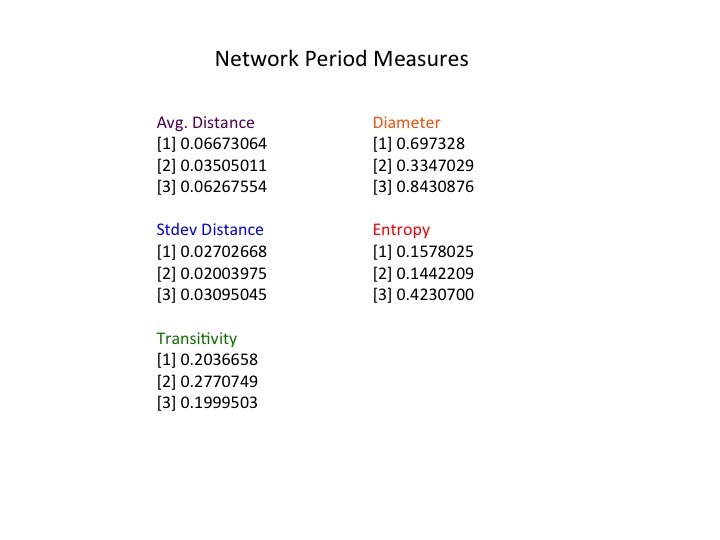 In addition, I’m including the measures used to calculate differences between the different period networks. 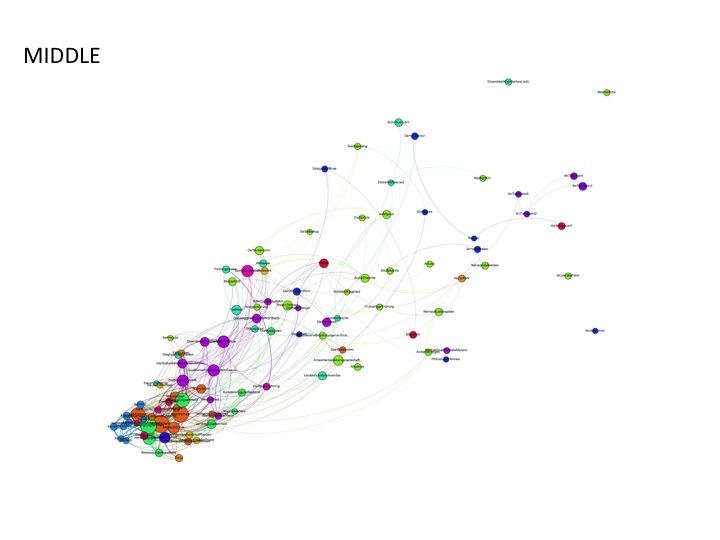 Goethe’s published poems color-coded by genre. Goethe’s Early Period. 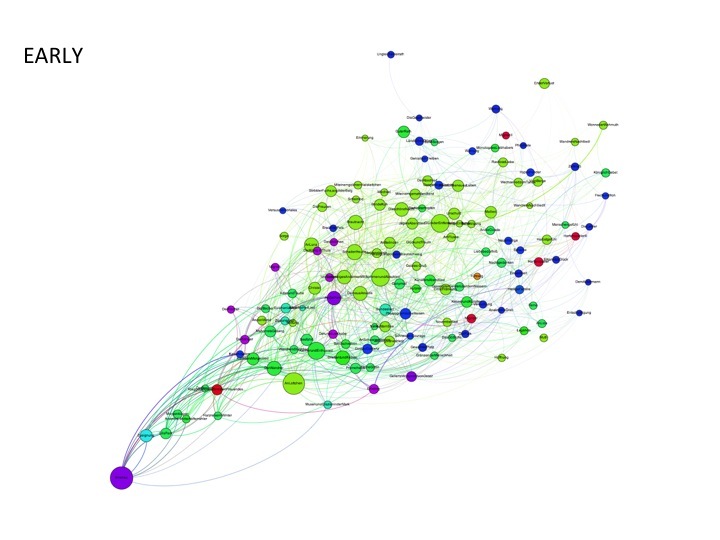 Notice the strong affiliation with the bright green nodes, which are “Lieder.” The large purple node (his poem on the opening of the Ilmenau mine) indicates the beginnings of what will be a new period and cluster. Goethe’s middle or “classical” period. This period is dominated by the Roman Elegies and the Venetian epigrams. Notice the very strong grouping of the poetry from this period in the lower left. Goethe’s late period. It is longer and larger than the others, but also marked by a much higher degree of generic heterogeneity (see the measures below). The oriential translations from the West-East Divan are the blue nodes in the lower left corner that mark a group unto themselves. But actually, what seems most interesting to me about this graph are those spikes before the dips. In fact they often coincide with the *beginnings* of the different periods in Goethe’s life. If we plot it by differentiating between the three periods, we can see how each period is marked by an opening spike followed by a dip. In other words, one way to think about “periods” in a poet’s work are as moments of increased experimentation followed-by lexical consolidation. This might give us one way of thinking about what we mean by “period” — not as something internally coherent, but quite the opposite, as that which is marked by a distinct rise and fall of dissimilarity. The truly interesting insight here is the way it appears that towards the end of Goethe’s life he was working his way towards a new period as we see that distinct uptick of vocabulary change when he is in his late 70s. Faustian striving indeed. 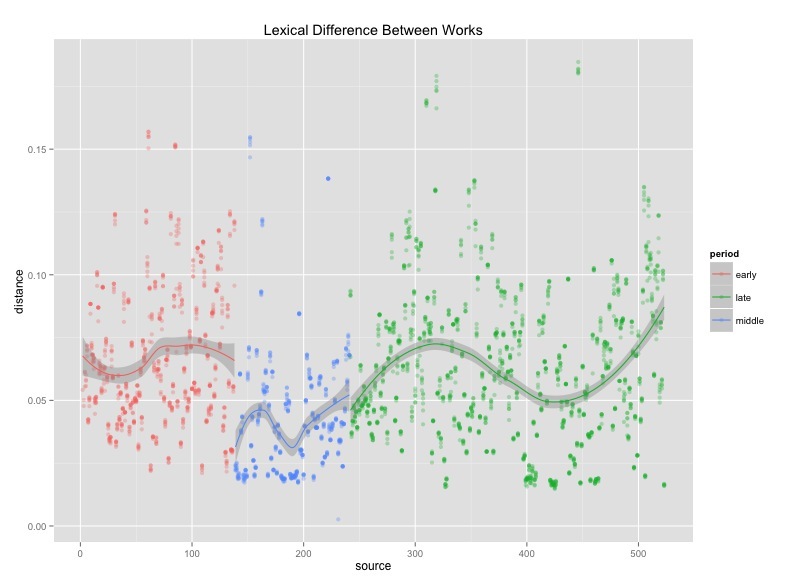 The lexical difference between connected poems across Goethe’s corpus, color-coded by period. So what we have so far are two different examples of how poet’s imagined their careers – Whitman moving ever more in the direction of closure and compaction, Goethe moving in the direction of expansion, one spiraling out, the other in. Wordsworth will give us a third model to work with, but for that I’ll create a separate post.